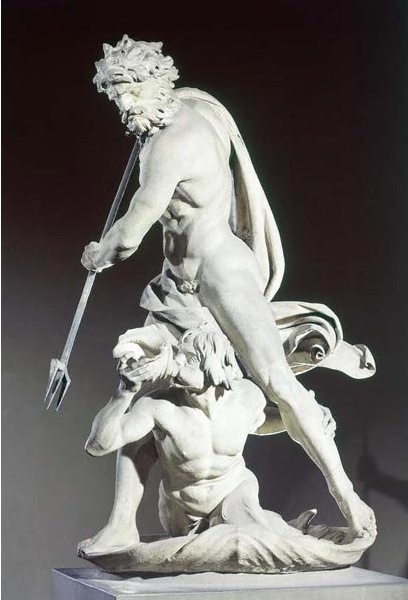 Bernini‘s Neptune and Triton was originally situated outside a Roman villa where you could see and hear water, birds singing, insects, people, the lot. Now it stands in a rather dull hall in the Victoria and Albert Museum. It’s not a bad room, really, and there are more than enough masterful sculptures to make it a great place to visit, but the fact that it is so bare just makes it clear how incredible it would be to see the swirl of that fabric made in marble glisten in the sunlight as fountains around it shoot water through the air. It is bare and makes it possible to examine every statue in detail, but one can only think that this is not the way Bernini’s incredible work was meant to be seen. Because it wasn’t. It needs the trees, the birds, the fountains, the people around it talking inanely and flaneurs trying to look cool, lovers lying to each other, children crying, dogs barking, the sun setting and rising, etc. You get the picture. It needs life around it. Otherwise, it’s just a lonely block of stone.